The unemployment rate measures the number of people actively looking for jobs as a share of those considered to be in the labor market. 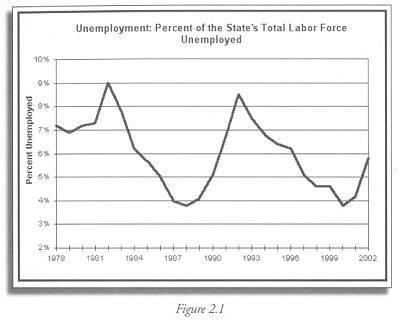 Unemployment affects individual well-being, and the rate of unemployment tells us about the health of the state’s economy. High unemployment means financial hardship for individuals and families. They, in turn, are less able to buy goods and services, which detracts from the strength of the economy. Communities with high unemployment often suffer from increased rates of crime, domestic violence, and substance abuse. Moreover, communities with high unemployment will collect less tax revenue, hampering the government’s ability to allocate resources to solving these social problems. Regional and ethnic disparities in unemployment rates in New Jersey may also divide us as a society, exacerbating inequity and social tension. Data on employment by sector complement the unemployment rate by shedding light on the structure of our economy. 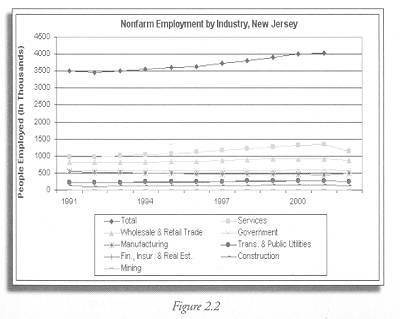 Figure 2.2 shows that New Jersey is increasingly a service-based state, which is consistent with the growth of hightech industry. Between 1991 and 2001 the service sector grew steadily. Wholesale and retail trade grew except for the last year of the time series, when it held constant. Manufacturing, on the other hand, has declined in absolute terms and, of course, as a share of employment. The unemployment rate does not tell us about underemployment, which exists when people are in very low-productivity positions or below their skill level. It also does not account for those who have given up on finding a job and dropped out of the labor market, nor does it include those who choose not to hold paid employment for family or other personal reasons. Information about these questions would provide a clearer understanding of employment in the state. (2) Bureau of Labor Statistics, http://data.bls.gov/servlet/SurveyOutputServlet?series_id= LASST34000004&data_tool=”EaG” As of September 2004, when this report went to press, data were available through August 2004.